I've completed a further three pages of these bird journals. These ones are for Sheila (theme: birds and associated stuff, colours browns, gold and cream); Maureen (theme: Birds/flowers vintage style, colours pastels pinks, green etc) and Wendy (theme: Birds, nests, eggs, butterflies, colours blues and green). I started off with a scrapbook paper for each front and inking, rubber stamping with versamark and mica powders for each back. 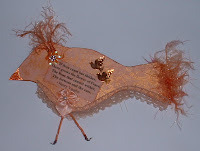 They were then embellished with printed images, text and other bits and pieces - and the beaded legs of course! I hope the receipients will like their pages - I think once they're all bound together with the other 5 pages from other members of the swap, they're all going to look great. Just my page left to do now. A reminder - you can find the template and an instructional video here. This is Wendy's page - front and back. This week's MAMMA theme is 'Mona Lisa'. Using an unmounted stamp of the lady herself, pressed directly into a petal point ink pad a nice effect was created. I rubber stamped some text onto the base and coloured it with some grey pastel and edged it with the same petal point dye ink. The Mona image was then mounted onto the base with some foam pads and a dymo strip 'Smile' completed it. I'm taking part in a bird journal jam swap I suppose you'd call it, organised by Margaret. She got the idea from Stampinton & Co who have an instuctional YouTube video and free template, both available here. So, there are six of us taking part (all from the Yahoo New Inspirations group) so we each need to make six bird shaped pages to each others' theme and colour. 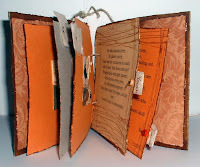 Once the pages are all complete, we can bind them together however we like. I've completed two of the pages so far. The first is for Viv whose theme was 'vintage floral' she was quite open about her colour preference but said muted pastels. Mine started off a bit muted, but ended up quite orange. Viv has assured me however, that she likes this colour - phew! The front side is a pretty floral scrapbook paper enhanced with a little mica powder. There is an image of a vintage lady with some flowers. The other side is rubber stamped with a swirly pattern in versamark and highligted with some mica powders. I found a quote which had a vintage feel about it and printed it onto vellum. The beak is some seed beads and there's a few little embellishments on there too - oh and not forgetting the beaded legs! The second one is for Margaret herself and her theme was nature - birds, flowers, butterflies etc with a colour scheme of green - pastels to dark. The front side is covered with a light green scrapbook paper which I lightly rubber stamped over. The iamges were printed and carefully cut out, glossy accented in part and stuck on. The text 'No bird soars too high if he soars with his own wings - William Blake' has been printed on vellum. The reverse side was painted a much brighter green and rubber stamped and highlighted with mica powders. The line of birds are also rubber stamped on and the middle one coloured. The duck on the tail is a decorative button and he's quacking 'Watch The Birdie'. Some lace, green plastraw (like raffia) and a metal butterfly completes it - again not forgetting the beaded legs! Two down, four to go - watch this space! 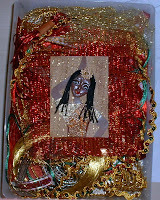 This week's MAMMA ATC swap was 'India - An Asian Experience'. 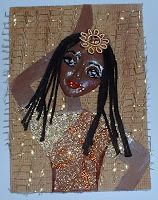 Here is my entry 'Indian Dancer' who is bedecked in some beautiful fabrics and wearing a very exotic head piece. This gave me an excuse to rifle through my little box of sumptious fabrics, mesh, glitter threads and the like. I must say thank you to Lubna though for the exquiste piece of fabric she once sent me, which I have used here as the dancer's sari. I recently joined a new site called Paper Digital Art and Images by Kim just because there was a charm swap going on and this is something I've been wanting to have a go at for some time now. The idea is to create 10 charms and receive 10 back. The charms can be made of any material, to any theme, colour and size - so there was a lot of scope there! 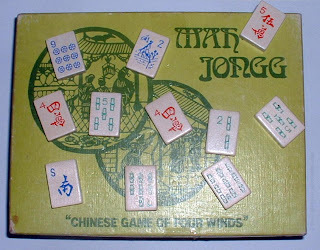 I used some Mah Jongg tiles for my charms as I recently bought a box in a charity shop for 50p - bargain! 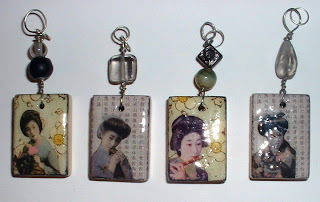 Seeing as I was using these tiles I decided to go with an oriental theme so used two different backgrounds and a few different Geisha images. Once the holes were drilled in the tiles (thanks to my OH!) I adhered the images (inkjet) with Mod Podge and lightly sanded and inked around all sides. Once thoroughly dry, I coated them with some Anita's 3-D Clear Gloss Finish and finished them off with some wire, various beads and jump rings. How charming they all look together - lol! Can't wait to get all the various charms back (they should all be posted by 1st March, so not too long to wait) and I'll post a picture of them when I get them - and once I've decided what to do with them all! This one is from Jennie over at her blog The Artistic Stamper where she is giving away lots of lovely goodies - you just need to visit her blog and leave a comment. To celebrate her 250th blogging post Elizabeth over on her blog Elizabeth Creates is giving away a beautiful specially Collaged 'Heart Quiltie' to commemorate the occassion. To be in with a chance of winning it you need to go to her blog and leave a comment! This month's theme for the UK Art Raffle is 'Trees'. If you don't know about the raffle, have a look at the site and if you enter an item of your artwork, you'll be in with a chance of winning every participants entry for the month! With a theme of 'trees' I didn't immediately know what to do as I don't have any suitable tree rubber stamps, so I had a look around the internet (as you do!) and came across a lovely poem called 'Plant A Tree' which was written in the 1800s by an American lady called Lucy Larcom You can read the poem here. I used the poem to make a little book. There are five pages - one verse on each. 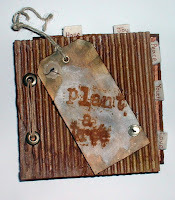 I kept an organic feel to the book making the covers from corrugated cardboard (coloured with distress inks and glimmer mists on the outside and decorated with scrapbook paper on the inside) The tag on the front cover has been aged with distressed inks and the words 'Plant A Tree' rubber stamped onto some handmade paper. Onto each of the inside pages I attached a small piece of handmade paper (stitched on with a small button) and wrote on it a pertinent word which appears on the second line of each verse. I must confess to one thing - I used shop bought 'toppers' for the back of each of the inside pages. I bought these years ago having never known what to do with them, but as I was making the book I remembered them and thought they'd go perfectly - with the colours and the theme. Just need to keep my fingers crossed now for the raffle, as I'd really like to keep this book now - doh! ATCs from Famous Works of Art! 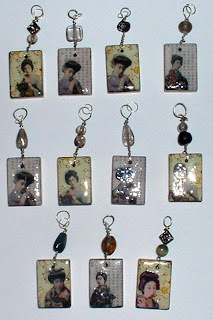 A new group has just been formed over on Flickr by Melody (AKA artsy fartsy queen) called Famous Works of Art ATCs . 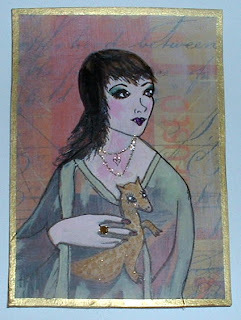 The idea is every Monday, Melody will challenge everyone to, and in her words 'recreate famous works of art on an ATC. 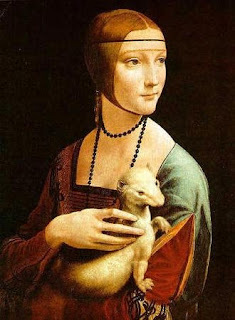 Not an exact copy of it necessarily but your interpretation of the famous piece' For this first week's challenge the work of art she has chosen is Leonardo da Vinci - 'Lady with an Ermine in Cracow'. Seeing as I'm a complete philistine I'm ashamed to say I'd never heard of this piece before - so thank goodness for the internet - I could read all about it on Wikipedia. I chose to give the image of the painting the Bernie Berlin treatment - using her technique for altering magazine images, by using gesso, acrylic paints and pens. I called my ATC 'A Present from Luddy' - as I thought maybe Cecilia had been given the pet by her lover Ludovico. 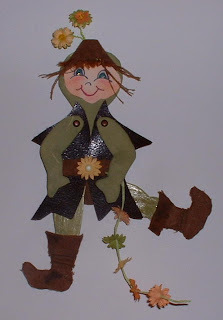 This month over on Flickr at the Monthly Art Doll (MAD) group, the theme was to create a paper doll using the template kindly provided by Tootieu (Melissa) with 'Spring' as the theme. I was lucky enough to swap paper dolls with Tootieu last month (the swap partners are randomly generated) The doll I received "Pierrot Bebe" was amazing and much sturdier than the ones I have made previously. So for this month's doll I took a leaf out of Tootieu's book and made a sandwich of thin cardboard (cereal box), cardstock and paper - glued it all together, left it for an hour or so under a heavy book then cut out the template. This was well worth the effort as the doll has much more substance to it than my others. My doll kind of evolved as I went along. It started off as Jack and The Beanstalk, turned into the Incredible Hulk and ended up looking like a little leprechaun! His body is coloured with fluid chalk and his clothes were actually recycled from the cover of an old diary (mock suede and leather). 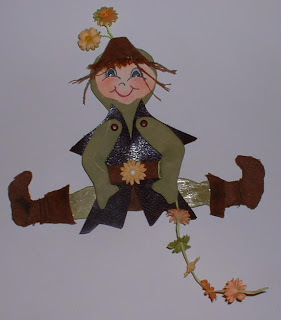 He is a spring time elf as he's been picking some flowers, popped a couple into his hat, one on his belt and made a daisy chain with the rest! He's a cheeky little fellow with a mischievous twinkle in his eye! Here are the three ATCs I made for the last three MAMMA challenges. Theme: Birds - I decided to use the plain old pigeon and sit him on the steps of St Pauls Catherdral in London. I used a background print of St Pauls and overlaid some of the words of the song 'Feed The Birds' from the film Mary Poppins (one of my all time faves!) by packing tape transfer method. The old pigeon has been printed, cut out and glossy accented .... wonder if he got any food! Theme: Triptych (the Cambridge dictionary defintion is "a piece of art made of three paintings connected to each other in a way that allows the two outer ones to fold in towards the larger central one" - saves me the trouble of trying to explain what one is! I called this one 'Wartime Waifs' and used some old corrugated cardboard which I tore random parts away from to create a distress look. On the central inside panel I also cut out a recess square which I was going to place a picture in, but that didn't work. I coloured the whole thing with some acrylic paint and distress inks and also used some distress embossing powder which gave a nice, rusty, aged effect. 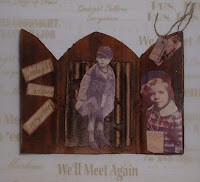 I attached some pictures of wartime children and added a couple of tags (again distressed by creasing and inking)with string. Theme: Zettiology If you don't know what this is (and I didn't until recently it's... well... weird! There is a group on Flickr dedicated to this which may explain all. 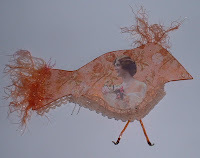 So my ATC which I've called 'Dressed To Impress' is my weird, but pretty zetti creation. It started off with a stripey heart shaped piece of handmade paper which I tweaked a bit with the scissors to create a curvy shape, then I decorated the base card with a lot of stripes and wavey shapes using some Sharpie pens. I stuck on the heart, painted a face and neck and drew in the facial details with the pens again (highlighted with bit of Stickles). The final touch with a hat (which was part of the heart I cut off from the body). Zetti is not really my thing, but I did enjoy making this one nonetheless. I've been 'tagged' by the lovely Jan. This is a new thing going around Blogger at the moment where you have to go to your photo album on your PC, pick the 6th album then the 6th photo and Blog it! and it is this one called 'Goth'. 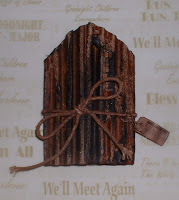 It is an ATC with some brick effect background scrapbook paper (suitably graffitied by me!) and the head of a Goth girl made from a mould with dried air clay. Apparently, I now have to tag five other people and ask them to do the same! I've only listed four - so if anyone else wants to play along, they can!